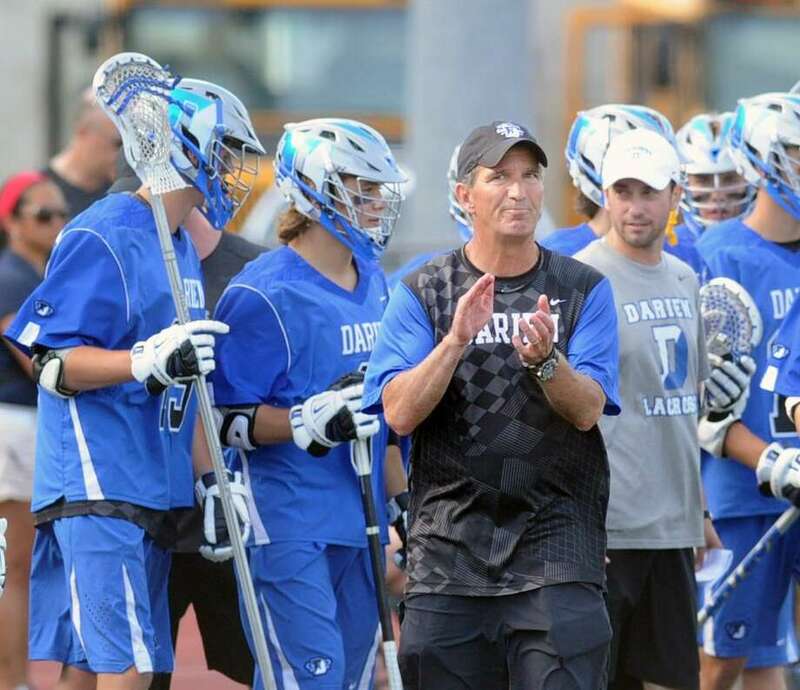 Darien boys lacrosse coach Jeff Brameier has a state record 553 victories — and counting. DARIEN — Dating back to 2015, the Darien lacrosse program has won 35 games in a row. In that time, it’s won two FCIAC and state titles. Overall, its won the last three state crowns, and 12 since 1997. These numbers are all, obviously, extremely impressive. But last Saturday at Niskayuna High School in New York, Blue Wave coach Jeff Brameier may have attached the most impressive number to the Darien lacrosse program — 552. As in, 552 wins as a coach. That number — which is now 553, and counting — is good enough for the Connecticut state record. Brameier passed former New Canaan coach Howard Benedict for the Connecticut record, and currently sits at seventh all-time in the nation. “The bottom line is, it’s a testament to the program and the people that have come through the program,” Brameier said. “I don’t really see it as an individual accomplishment as much as where we’ve built the program from top to bottom. We have a great youth program, we have a great athletic program at Darien High School. While Brameier remains the steady presence on the sideline, it’s the individual classes year in and year out that bear the load of continuing the Darien legacy. One of those players was Mark Evanchick. The defenseman — who played on the varsity team all four of his years in Darien, earning All-American honors in his senior year and a scholarship to the University of Pennsylvania, where he is currently a freshman — said Brameier’s ability to connect to each individual class is what sets him apart. As of now, the Under Armour/Inside Lacrosse National Rankings back up Evanchick’s praise. Darien sits at No. 2 in the poll, behind only Hill Academy of Ontario — making Darien the top-ranked American team. That kind of sustained success doesn’t happen overnight. Brameier has been at the helm of the Darien program since its inception in 1984. By his own account, Darien had to take its lumps as it battled to gain notoriety in the state with the titans of the time — New Canaan and Wilton. Current Wilton coach John Wiseman was a player on the Warriors team at that time, and saw the relationship between his coach — Guy Whitten — and a young Brameier develop. Wiseman — who is in his ninth year as head of the program and has two state championships to his name — has had the rare opportunity to see not just what Darien and Brameier have been able to do in the recent past, but how far he’s come. That work ethic, and Brameier’s ability to ingrain it into his players, is what sticks out in the mind of Evanchick. While the record is nice, it just reaffirms what Evanchick, and the rest of the Darien lacrosse community, already believes.